Tucked away in a rural pastoral setting, Kilby Provincial Park is characterized by its scenic riverfront location and wonderful pioneer history. The park offers a destination rivering experience. Activities include beaching, fishing, and boating on Harrison River and Harrison Lake. Park users can also enjoy camping, picnicking, and visiting the nearby General Store Museum, where they can view and experience early twentieth century rural traditions and lifestyle common to British Columbia. The campground is open year-round with off-season rates in effect during winter months and senior rates during shoulder seasons. Please refer to Kilby.ca for fee information. The Harrison River is susceptible to extreme water levels and velocities during spring/summer run-off season. Watch for log pilings in the river, opposite the campground. This park is cooperatively managed by the Fraser Heritage Society, a charitable, non-profit society, and the District of Kent, on behalf of the province of B.C. Services and facilities may differ from those offered in other BC provincial parks. This park has both reservable sites and first-come, first-served sites. For details of camping information, fees, rules, reservation policies and reservable sites with dimensions, please see Welcome to Kilby Campground [PDF]. The park is located at Harrison Mills, 15 km west of Agassiz. From Highway 7, follow the Provincial Park and binocular logo directional signs south onto School Road at the eastern end of the highway bridge. Continue straight to the T-junction and turn right onto Kilby Road, past the historic Kilby General Store and Farm, and continue to the park. The closest communities, towns and cities are Harrison Mills, Agassiz and Harrison Hot Springs. History: The first settlers to pre-empt land in this area were farmers, one of whom started milling lumber in 1870. From 1870 to 1910, a succession of sawmills came into operation and with them, the community grew. Thomas Kilby came to Harrison Mills in 1902 and by 1904, had built a three-story building consisting of a general store and hotel. His son, Acton and wife, Jessie ran this operation until their retirement in 1976. The Provincial Government acquired this area. Today, the general store is a museum and is operated by the Ministry responsible for Tourism. 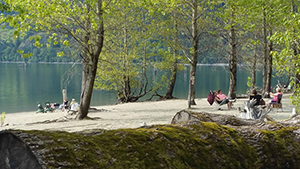 The beach area has been developed into a riverside park with 22 campsites, a small day-use area, and a boat launch under the jurisdiction of BC Parks. Cultural Heritage: The Harrison and Fraser Rivers served as major transportation routes for the local First Nations population. In the mid to late 1800s, the Fraser River and Cariboo gold rushes created considerable activity along the Harrison River, near the site of this historic park. Conservation: The park lies within the Coastal Western Hemlock biogeoclimatic zone and is representative of the Fraser floodplain landscape. Upland vegetation includes cottonwood, poplar, alder, and willow while the understory consists largely of red currant and salmonberry. Wildlife: Kilby Provincial Park is a designated British Columbia Wildlife Watch area. It is an excellent location to view large concentrations of wintering Bald Eagles as well as graceful trumpeter swans that migrate to the area from Alaska. Other common bird species to the park area include ravens, geese, eagles, swans, finches, chickadees and jays. Coho and Spring salmon can be found in Harrison River which borders the park. Swimmers: watch for drop-offs! Water can be very cold. There are no lifeguards on duty at provincial parks. There are waterskiing opportunities on the river and at Harrison Bay, nearby. There is no viewing platform but the winter months offer viewings of eagles and trumpeter swans. There is a paved single wide boat launch located in the day-use area. There is parking available for vehicles and boats trailers during the day only; no overnight parking. Boats can be left in the water or beached overnight at the owners own risk. There is no marina nearby to moor boats overnight. Waterskiing is permitted on the river. While campfires are allowed and campfire rings are provided at each campsite, we encourage visitors to conserve wood and protect the environment by minimizing the use of fire and using campstoves instead. Firewood may be purchased in the park, please contact the Park Operator, or you may bring your own wood. Fees for firewood are set locally and may vary from park to park. Limited burning hours or campfire bans may be implemented. To preserve vegetation and ground cover, please don’t gather firewood from the area around your campsite or elsewhere in the park (this is a ticketable offence under the Park Act). Dead wood is an important habitat element for many plants and animals and it adds organic matter to the soil. This park has a day-use/picnic area with picnic tables and pit toilets available. Bring your own barbeques and briquettes. The beach area is sandy (dogs are not permitted on the beach area). Open fires are prohibited. This park only has pit toilets; no flush toilets. Pit toilets are available in both the campground and day-use areas. This park offers 35 vehicle accessible campsites, both reservable sites, and first-come, first-served sites are available. There are no double or pull-through campsites available. Some sites are amid the trees, and others are in open areas near the beach. Maximum two vehicles per site. There is no parking available for extra vehicles. There is no gatehouse. If there is no staff to help you locate a site, find a campsite with no ticket number on the post. Park staff will come by to collect camping fees. Sometimes the gate is locked in the off-season due to environmental conditions. The closest store is in Harrison Mills, approximately 5 kilometres west on Highway #7.